THREE MORE WEEKS OF YOUTH SUMMER CAMPS! Sign your child up today for three weeks of our Youth Summer Camps! If your child ages 6-14 isn’t into competitive sports, they’ll especially love the Learning2Fly camp. If your kids are athletes, they’ll love the physical challenges with the aerial apparatus each day. 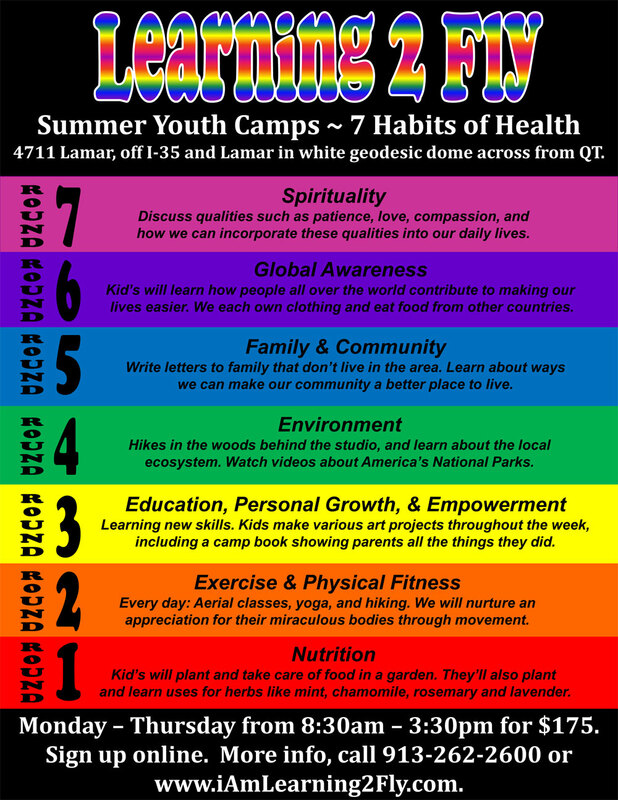 We focus on 7 habits of health, art, aerial, and yoga. Your child’s whole body, whole mind, whole spirit! Daily aerial classes, creative art projects, hiking in woods, yoga, working in a community garden, other fun activities to enrich your child’s education in a fun way. Mon – Thurs 8:30am – 3:30pm for $190. Kid’s need to bring their own lunch. Learning2Fly ~ WHERE THE IMPOSSIBLE BECOMES POSSIBLE!